Preppy Pink Crocodile: Where Was I? American Girl!!! I had a Bitty Baby and a couple regular dolls! Love it!!! 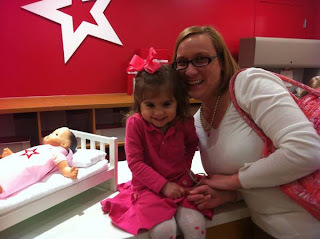 American Girl with a special little girl! :) Hope you had fun. American Girl. I know it well. My daughter's favorite hangout. You are so cute!! Yes, we all know the American Girl doll store! I'm so glad you have kept up with me... now hopefully I can keep up! Please update with the new blog address and thank you for your helpful tips!!! How fun! I haven't been to the American Girl store yet but we collect Bitty Baby items. Your little friend has the most excited look on her face!